My folks scanned a batch of old photos, giving each of us a CD of what they thought we’d like. Looking through my collection of pictures was sentimental & nostalgic, mystifying & embarrassing. Many of the shots are groups gathered around a birthday cake, groups posed on & around an armless sofa, smaller groups in front of our smoked-stained fireplace in matching yellow dress, or standing with easter baskets in front of the flowering quince. There are pictures of the neighborhood gang filling up my cousin’s above-ground pool, pictures of us on farm equipment, emoting on haystacks, with arms around my always huggable grandma during summer trips to Grandpa’s Eastern Oregon farm. There are pairs of us on the front steps, first day of school, complete with note-pinned-to-coat for bus driver or teacher; pictures of us with the same next-door cousins, hanging around their cabin near Leavenworth. Individual shots show us opening a Christmas gift, posing with a sailboat-shaped birthday cake, or dressed for the 5th Grade Potlatch at school. Some of the photos riveted me. What we still call “The Cabin,” the mountain vacation home of my maternal Aunt & Uncle, lies nestled in the eastern slopes of the Cascades. The access road was originally cut for logging operations, and was just one of a maze of logging roads crisscrossing all through the area. Piling onto the back of Dad’s Suzuki or Uncle’s Honda 90, careful of the hot exhaust pipe, we would ride these roads for what seemed like hours, I privately terrified of the bear or mountain lion we were sure to encounter. For longer trips, or if we wanted to trek all the way to the Sugarloaf Mountain Fire Lookout, we would station wagon it. This photo hails from one of those trips. Though dressed for the warmer valley far below, we thrilled to still find snow. Maritime PNW weather, even back then, didn’t give us much snow in winter. Winter driving over the mountain pass, the significant measure of Cascade snow fall, and the lack of snowplows on logging roads, meant there weren’t many winter trips to the cabin. Finding this snow must have been exhilarating. Snow to us was better than gold. My cousins look as though interrupted, waiting for the photo to finish, so they can continue with the serious work of snow. My sister, always button-cute, in the fall-leafed fuzzy coat that was never a hand-me-down from me, closing her eyes, not from usual shyness, but from the direct, bright mountain sun. I, draped in the station wagon blanket, rocking olive-green leggings before being called leggings, with mustard-colored sweatshirt, and blue sneakers, strike a pose, though will never know if intentional or the accidental capture of personality that cameras sometimes manage. I guess what gripped me with this shot was seeing that somewhere, far away from now, this one-day-would-be Trooper, Attorney, Poet, and WhateverItIsIAm, were on top of a mountain together. 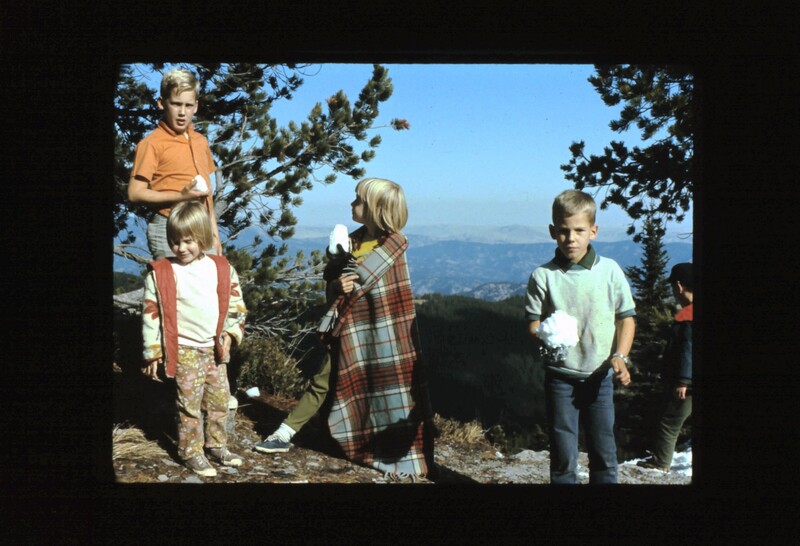 These pictured people who I don’t know, these kids I only vaguely remember outside of photographs, but whose experiences made me, one whose breath I still breathe, were standing in the crisp, cold, bright sun, far above sea level, holding lumps of late Spring snow. They were living life. They had yet to finish school, yet to get married or divorced or widowed, yet to become parents, yet to visit therapists, yet to learn the language of awareness. They just were. Sometimes I wish I remembered more about that blanket-draped, fierce, blonde person. Sometimes I am sorry for the parts I do remember: manipulation given & received, inhibition of, instead of permission for, personality, all that accompanies unmet expectation-being too much, not being enough. I don’t look at old pictures very often. There is so much that occupies today. However, pictures from the past can be tools to unlock joy and pain, to open up a rivulet of I Remember That, to accept the past for what it was. I did not have a terrible childhood. People who tried their best on my behalf surrounded me. It could have been better, it did leave me with scars and marks and issues to attend to, but with gratitude for the right now, I once again renew my vow to live. I will hug my son, cherish my spouse, be patient with the dog, start more seeds, let the chickens out to forage, get thoughts onto paper. With this picture in my hand, this image of me posing as royalty, not succumbing to the wishes of the photographer, holding a fortune in snow, I breathe deep and continue my story: a wife, a mother, a baker, a teacher, a writer, a woman, myself. This entry was posted in General and tagged awareness, cousins, Honda 90, Leavenworth, sisters, snow, Sugarloaf, vacation. Bookmark the permalink. Yes yes! Thank you for this lovely reminder, and glimpse of little Mighty Lisa!